The People of the Labyrinths launched Luctor et Emergo, their first fragrance, in 1998. Luctor et Emergo is now, I should think, officially a cult classic, having first been nominated for cult status by Style Magazine in 2002. There are plenty of people who don't love it (it wouldn't be a cult scent otherwise, right? ), but those of us that do are rather besotted with the stuff, to put it mildly. It is one of few fragrances that I am still as enchanted with today as I was when I first smelled it. Nine years, of course, is rather a long wait for a follow-up, and so it is no surprise that A.MAZE (and I'm just going to go ahead and refer to it as Amaze for the rest of this article) was released to more-than-usually heightened expectations. The notes include henna, saffron, Taif rose, orange blossom, Wardia rose, agarwood, sandalwood, musk and civet. The top notes of Amaze are a a gorgeously rich blend of saffron and rose, with the henna adding its characteristic, hard-to-describe smell: a bit earthy, a bit herbal. The agarwood adds depth, but it does not, as it does in both 10 Corso Como and Montale Aoud Roses Petals, come out fighting at the start, so you won't have to wait for the medicinal haze to settle before you can inhale deeply. And if you love rose, you'll want to inhale deeply: the rose here is vivid and bright, yet very full-bodied; there is nothing in the least dewy (or girly) about it. The dry down is woody and deep, and it stays very rich; still, it isn't heavy, and to my nose, it isn't quite dark. There is a whisper of orange blossom, but it is primarily a rose scent, much more so than the Montale or 10 Corso Como mentioned above. There is just the right touch of civet: Amaze has a satisfying oomph, but isn't so animalic that you'd have trouble wearing it to work. So how does it stand up to Luctor et Emergo (pardon the pun)? Well, the thing about Luctor et Emergo is that while it probably doesn't qualify as a Great Perfume, it is eerily evocative, more so than almost any other scent I know. I think of it as more of a mood than a perfume. Luctor et Emergo is also very much an original — it is a little weird, and just doesn't smell like anything else out there, and in that sense, is a good fit with the brand's ethos. Amaze doesn't quite reach those heights. Don't get me wrong, it is a lovely perfume. I want a bottle. Very much. But it isn't particularly evocative, there is nothing even vaguely weird about it, and I wouldn't call it wildly original, in fact, over the past week, I've worn it next to at least six other perfumes that seemed to invite comparison. It doesn't smell exactly like any of them, so unless you're the sort of person who would only buy one rose scent (horrors! you must have at least a few?) it is very much worth trying. Amaze is available in Eau de Toilette ($125 for 90 ml) and Eau de Parfum ($165 for 90 ml). The lasting power of the Eau de Parfum (please note that The People of the Labyrinths call it a Parfum) is excellent. 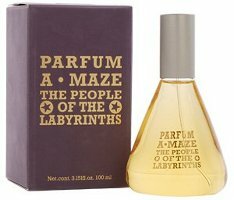 For buying information, see the listing for The People of the Labyrinths under Perfume Houses. Why do you say that POTL does not qualify as a great perfume? Just curious. And I cannot, of course. But if I was trying to come up with, say, the 100 greatest achievements in the field of perfumery, POTL wouldn't come to mind, whereas if I was thinking of my own desert island top 10, it would most certainly make the list. The same goes for Diptyque Philosykos, for that matter. If you were to ask me which was a Great Perfume, Philosykos or Chanel no. 5, I'd of course say the Chanel, but if you were to offer me a choice of the two bottles, I'd grab the Diptyque and run. Eau d'Italie Paestum Rose: they are very different; the PR is much more sheer, way less rose-focused. Le Labo Rose 31: the LL is much spicier and woodier, again, very different. Agent Provocateur: I tried these together mostly because they are both rose/saffron, but the styles are so different it was hardly worth the exercise. Of all of the above, it is closest to the Montale. The Amaze is much more wearable and “pretty” than the Montale, with much more rose…I certainly wouldn't write it off if you didn't like the Montale. I suppose my point was not that Amaze smells just like something else, but that you can easily enough think of similar things worth at least trying next to it. I don't think that is so with Luctor et Emergo. Why doesn't POTL do 50 ml bottles, LOL? I'd own one already. I do hate buying 100 ml. Exactly Or even 30ml. Did you see the 30ml PdN bottles on Beautyhabit? So great! R, I must be the only one so far who is not feeling the love. I'll have to whip out my sample again, but on me, Amaze was too medicinal. But, I love me some POTL body cream. Now that one, if they ever give body creams any sort of rating, IS a classic! Nope, it has not received universal love, I don't think — I read several less than favorable comments on MUA. And can't deny the medicinal — anything with agarwood smells medicinal, I think, and in this case the henna perhaps increases the medicinal part. I just love that smell! I'm really not sure what to make of Amaze. It starts off on me with a kind of melted plastic note, which thankfully dissipates quickly, but then I'm left with a strange, herbal floral that seems to grow sour over the course of time. Which sounds as if I hate it, but I don't. I think it may just take some time to 'get'. I tested it along with Divine l'Inspiratrice and Tocca Touch, and it took me a couple of days to 'learn' which one was which – there were enough similarities to confuse me. It just doesn't feel as if it comes from the same stable as L&E, which is utterly unique – this one is fascinating, but not quite one-of-a-kind, as you say. You know, agarwood sort of grows on you, I think — I used to think the first few minutes of 10 Corso Como were horrible, now I love it right from the start, and same is true of many other oudh scents. So “melted plastic” might be accurate, I just don't “smell it that way”, if that makes any sense at all, in fact, I thought the oudh was subtle. Agree it has a definite herbal undertone. What did you think of the Divine? Haven't opened my sample yet. All I have to say is: I agree with everything you wrote! POTL doesn't smell good on me at all, but I know whereof you speak (more of a mood, etc.) and I wish I got what you got. Amaze, yes — I thought of Paestum Rose and Ta'if, and while it's a dupe of neither, it's not breaking any new ground. POTL is a one-off; so far as I can tell from the people who love it, there is nothing else in that niche. But I will. And this 'un too. Would love to know who the perfumers were for both of these, M — they did a good job on both. And maybe Amaze will find a wider audience? But it also doesn't fit in with the lab bottle packaging as well as LeE. Will be curious to hear what you think then…certainly you'll be able to try Amaze with an open mind, more than I could. Well R, while I haven't had the opportunity to smell AMAZE yet, you made me get out my Luctor sample and revisit it as I remember not “getting it” the first few times I tried it. Today though, I'm definitely getting a mood from it. It is interesting. Play Doh. Thats all I can seem to ever smell from this one and I think if I didn't read that it smelled like Play-Doh, I probably wouldn't have placed the scent (or maybe I would have, who knows) but ever since I read Play Doh thats ALL I can smell. When you said saffron plus rose, I immediately thought of Safran Troublant, in which the rose is a short-lived, but breathtakingly beautiful, element. How does Amaze compare to it? I hardly ever wear them, but I love honest-to-god rose scents. Well, I certainly like it, but I haven't decided yet if I need a bottle. I kinda wish it were MORE medicinal (since I am a big fan of both Montale Rose Petals and 10 CC, this is not a surprise). Still, you're not alone — for many people, it is just “that Play Doh perfume”! The balance is the opposite to me: ST is mostly saffron with some rose, this is mostly rose (and woods) with some saffron. ST is also both creamier & more transparent. I know what you mean — I wouldn't mind more oudh either. The rose note in this one is so much prettier (to my nose) than the rose in Montale though. Amazing how chemistry affects a scent. I ordered a sample of A-Maze through LuckyScent and as soon as I put it on I was overwhelmed and I had to wash it off immediately. It's a big, loud, sharp rose on me and if anyone wants my sample, email me. I'd love to try your sample, but there's no active link in order to email you! I'm head over heels about this one. Was SO relieved that it wasn't “light” as the description had suggested. My only question is whether or not I need the edt or edp. W/ the original there was a real difference to my nose between the edtp and edp (not just in lasting power). I've so far only smelled the edt of A Maze. Do you think there's a difference? Am trying to decide which to get. Agree, it isn't particulary light at all and no idea why they are using that term in the description. I have only smelled the EdP of Amaze so can't compare, but based on having smelled Luctor et Emergo in both forms, would personally recommend that you stick with the EdP. The EdT of LeE lacks the depth of the EdP, although I find both to have very good lasting power. My email is dawnkana@yahoo.com. Just shoot me an email with your mailing address and I'll pop this in the mail to you. And Zeram1, if you'll also post here that you've seen this message, I'll delete the above so Dawn's address isn't hanging out in cyberspace. Thanks! My skin destryed each and every one of the interesting notes and all I got was this very mellow rose. Not bad at all, but nothing to dream about, either.